If anything 2012 Sauternes and Barsac is a little better than expected in what was an extremely difficult harvest in the region, spoiled by vintage rain. The very best wines are light yet with enough depth to make appetizing sweet wine that will be comparatively early maturing. A few are in a strange sort of purgatory, a half-way house position, between sweet styles and the off-dry, emphasizing the kind of all-or-nothing risk taking that Bordeaux’s bravest winemakers undertake here each vintage. There’s always the danger that you might get left high and dry in Sauternes [no pun intended] and some brave souls clearly have. The harvest is always complex here even in the trio of excellent back-to-back vintages 2009-2011. Great Sauternes years rely on the widespread presence of the concentrating powers of botrytis cinerea, the so-called ‘noble rot’ that requires a strange alchemy between sun, wind and moisture to develop. The very dry spell of weather that lasted from mid-July through to the end of September in 2012, though good for general ripening and the white wine harvest elsewhere [especially in Pessac-Léognan], provided conditions obviously unfavourable to the development of botrytis. So proprietors here had little choice but to let the grapes hang out on the line like laundry well into October in pursuit of rot of the very best sort. And that’s when the weather turned distinctly tricky. It’s difficult to generalize, but spells of heavy rain rather ruined things, and at critical moments a drying wind and the sun failed to materialize. The overall results, though variable, are perhaps remarkable when you consider the vintage. Apart from the odd slice of good fortune I think we can put this down to proprietors writing off large sections of the harvest and the wines. What’s in the glass represents the strictest selection of the strictest selection, both in the vineyard and in the chais. This makes the vintage extremely good value if you look at the effort put in and the financial sacrifices made. Still that’s the last thing most consumers will ponder. More likely they will remember 2012 as the year Chateau d’Yquem [followed by Rieussec and few others] announced that the vintage simply wasn’t good enough for them to release a grand vin. A resounding ‘Bravo!’ then, surely, to those who did. The best have confounded expectations and managed to produce wine of true elegance and finesse. The pick of the crop? For me the best amongst the premier cru chateaux are Sigalas Rabaud, Rabaud-Promis, de Rayne-Vigneau, La Tour Blanche and Coutet. Then amongst the second crus Doisy-Daëne, Doisy-Védrines, de Malle and de Myrat have made elegant and potentially attractive wines. There’s a fair margin of error here – not downwards but upwards. 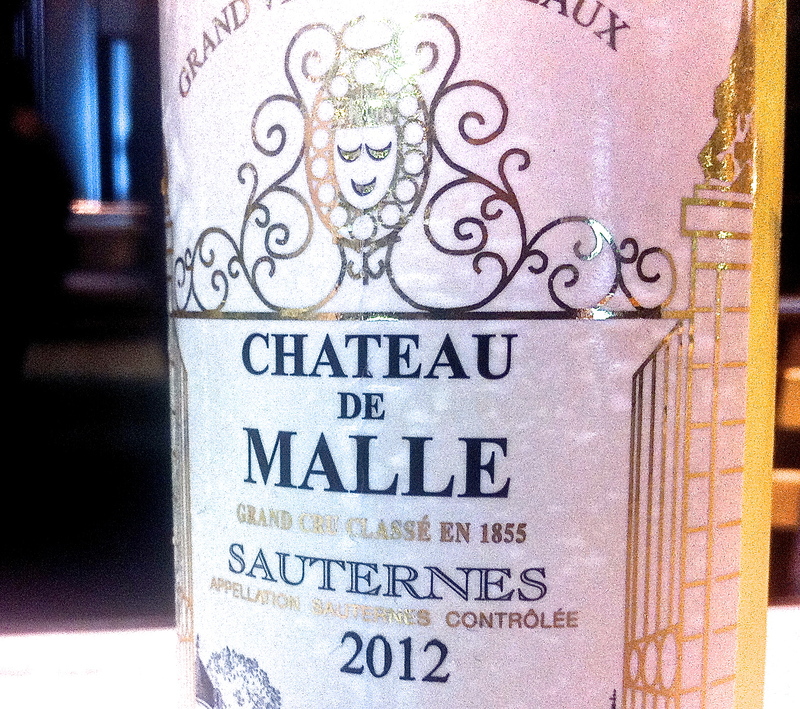 Sauternes is so very tricky to judge as an infant [surely the most tricky of all Bordeaux’s wines to assess early on?] that I’d expect all the wines below to fill out and develop further in cask and in bottle [in the short to medium term at least]. Below are the notes on the sixteen wines in the order that they were tasted at the Union des Grand Crus de Bordeaux event held at Chateau La Lagune on Thursday April 11, 2013. They were presented by classification, lower to higher, but as you’ll see that’s not to say that the ultimate quality of the wines lies exactly in that manner. Pale straw; some burnt notes; oak on the palate; not sweet. All at sea to me. 75% Sémillon, 15% Sauvignon Blanc, 10% Muscadelle. UGC April 11, 2013. 82-84? Quite gold; little dumb at first; cream; quite sweet palate but lacks a bit of zap and zing. Not a great sample or expressive sample. 95% Sémillon, 5% Sauvignon Blanc. UGC April 11, 2013. 86-87?